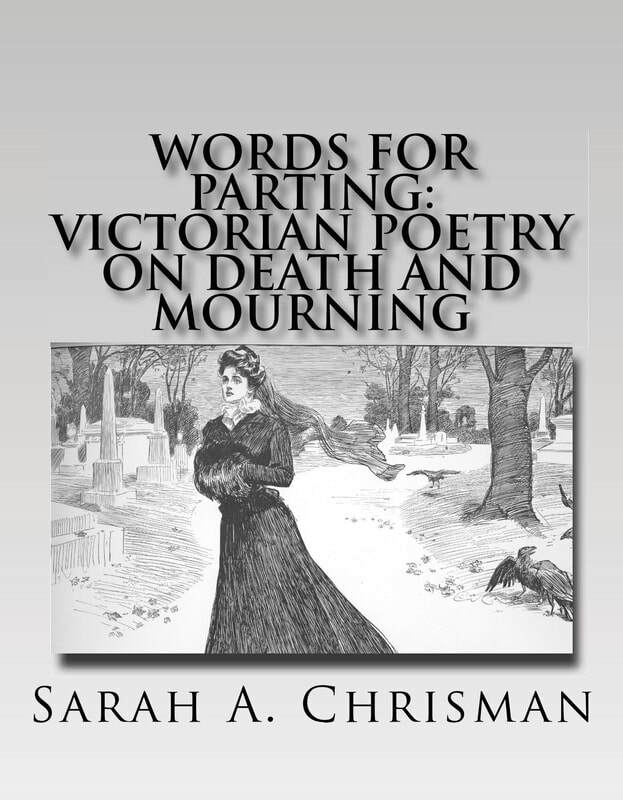 Remember to check out Sarah's books while you're online! 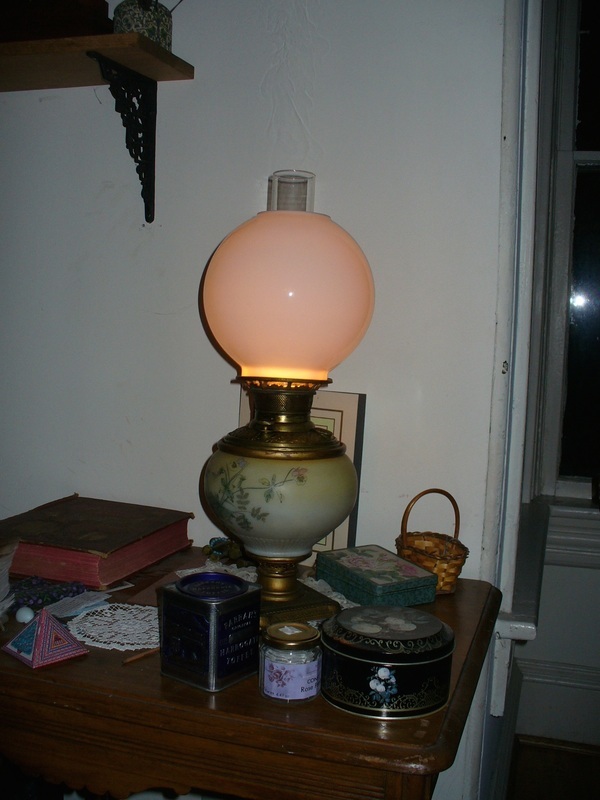 First, flat wick lamps: these are familiar to most people. A flat wick lamp, as the name implies, have flat wicks (available now at most hardware stores). Flame spreaders are designed to control the flare of the flame. 1.) Move the wick up to light it. 2.) Move it down slightly BELOW the top of the flame spreader. 3.) Replace the lamp chimney. 4.) If the room is very cold, turn the wick down a little more and give the chimney a minute or so to warm up so that when you raise the wick the sudden heat won't crack the glass. 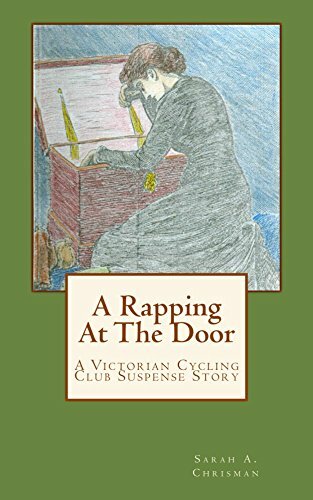 If the air in the room isn't terribly cold you can skip straight to #5. 5.) Adjust the wick to maximize the light. Experiment with moving it up and down until it gives out maximum light. There's a sort of "sweet spot" where the wick is high enough to get maximum oxygen but not so high that the wick itself is showing above the flame spreader. The top of the wick when it's burning should be just BELOW the flame spreader. If the wick protrudes above the flame spreader (as in nearly every modern photograph and Hollywood production), a couple different problems arise. First and foremost, it will be burning the wick itself: you don't want to burn the wick itself, you want to burn the oil. The wick is just a medium for transporting oil to the flame. The wick itself will not burn as brightly as the oil. (Think about it this way: light is energy, and so are calories. Cotton is a carbohydrate, oil is a fat. Carbs have fewer calories than fat. A cotton wick won't burn as brightly as oil.) When the wick burns, not only is the light dimmer than it should be, but the burning cotton produces soot. 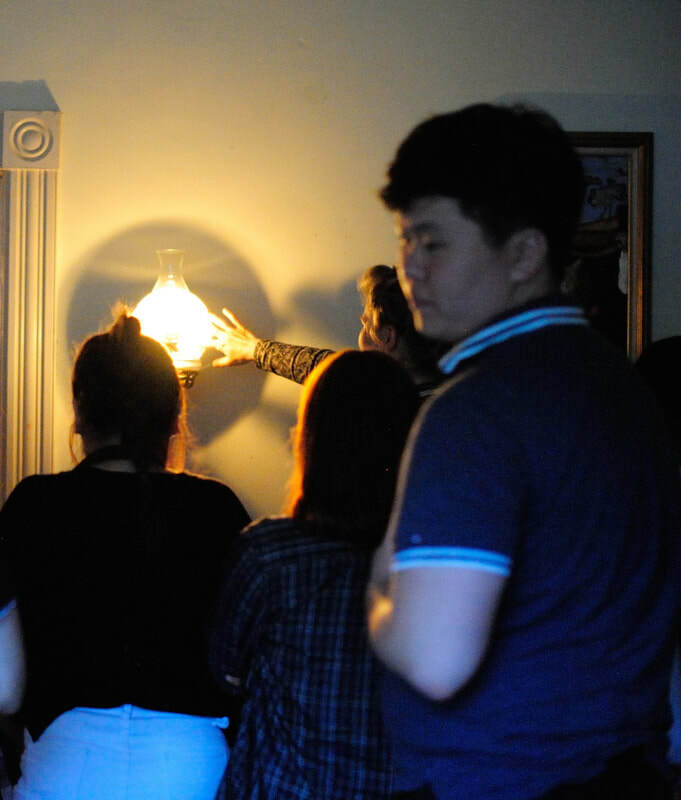 Soot clouds up the glass; not only does it actively block the light, but it also builds up chemicals inside the chimney that choke out the flame and contribute to the dimness of an improperly adjusted lamp. Film producers often cover lamp chimneys with black paint to hide the electric bulbs inside the props being used to represent oil lamps; an actual oil lamp with a chimney as filthy as those seen in movies would be unusable. If a lamp is properly adjusted so the wick is in the right place for maximum brightness it won't produce any soot at all, or hardly any. —If char builds up on the wick, trim it neatly with a pair of sharp scissors. 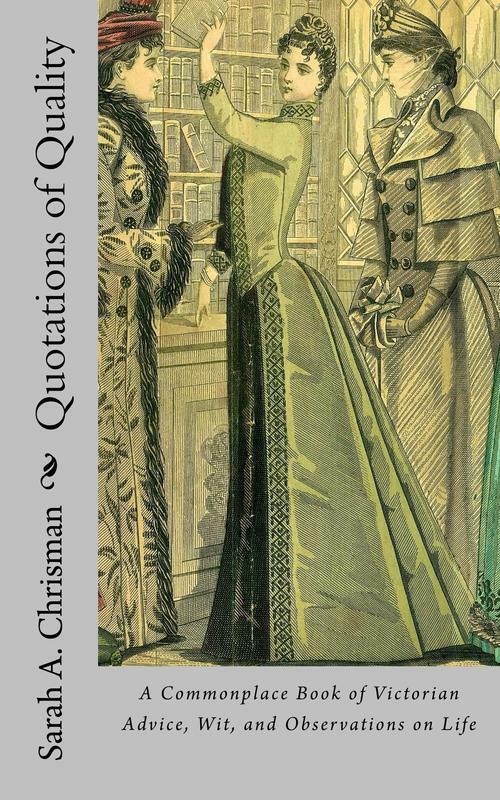 —If any soot shows on the chimney or when dust builds up on it, wash it as you would a drinking glass. —When installing a new wick in any oil-based appliance, wait for the wick to be completely saturated with oil before lighting it. (See the discussion above on burning the oil, not the wick.) This will take anywhere from an hour to overnight, depending on the size of the wick. —Most important (and most often overlooked): check the air intake holes of the burner regularly. When any dust or lint builds up on them, clean it off with an old toothbrush. Flames need oxygen; the difference between the light given by a lamp with dust on its air intake vents and one that's just been cleaned can be quite dramatic. In the nineteenth-century, it was standard practice to put flat wick lamps in sconces fitted with dish-like mercury glass reflectors. This dramatically increased the light, as well as focusing it. We have a mercury glass reflector for the lamp in our parlor. 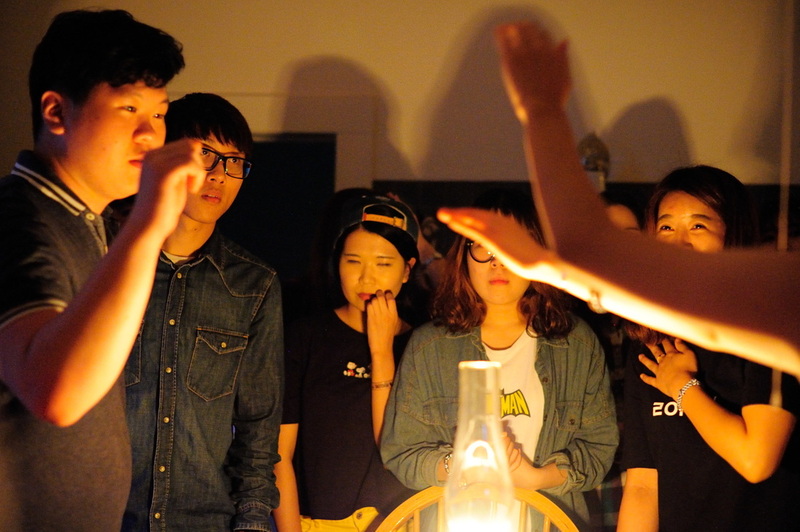 Below: Me lighting this same lamp, watched by a group of students who visited our home. You can see how dramatically the light increases after I replace the chimney on the lamp; waiting to adjust the wick until after the chimney has been replaced helps ensure that it has been raised to the proper level. Note that this extremely bright light is produced by a single lamp and a flat wick one at that! Circular wick lamps are brighter by orders of magnitude. 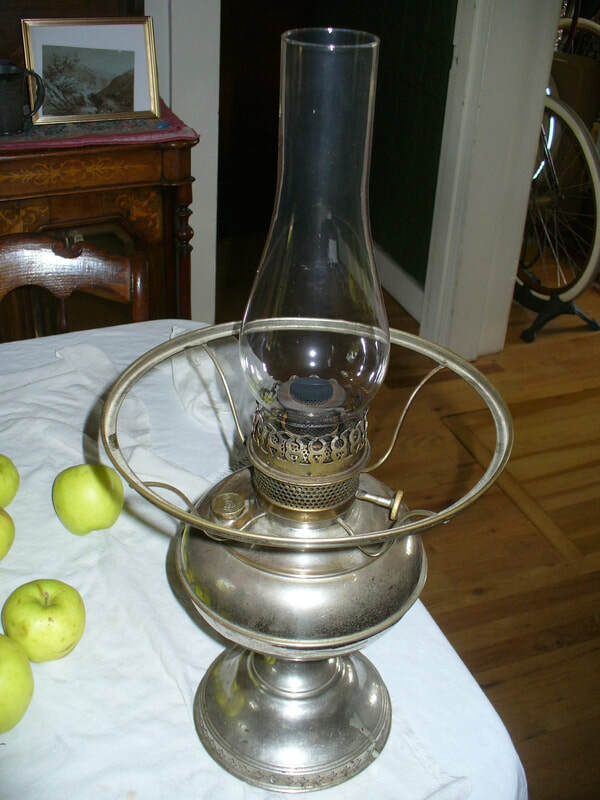 Circular wick lamps came onto the scene in the 1880's and were ubiquitous by the late 1890's. Again as the name implies, circular wick lamps have a wick that forms a circle. This does two very important things to increase the light they produce: it makes the wick much larger (compare the circumference of a circle to a straight line), and it creates the perfect situation to deliver maximum oxygen to the flame. Air comes in through vents at the sides of the lamp then rushes up the center, drawn by the heat of the flame as soon as it gets going. 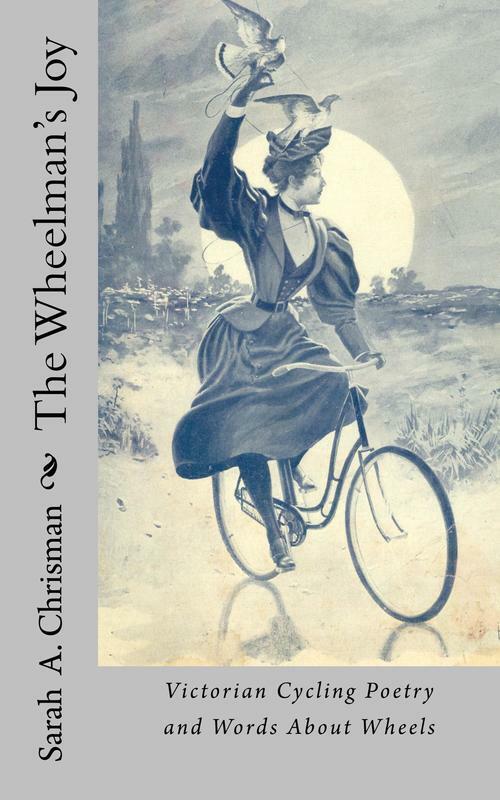 The circular wick lamps were a massive innovation and improvement over the old flat wick lamps, which is led to them becoming very popular very quickly —they were everywhere by the turn of the 20th-century. 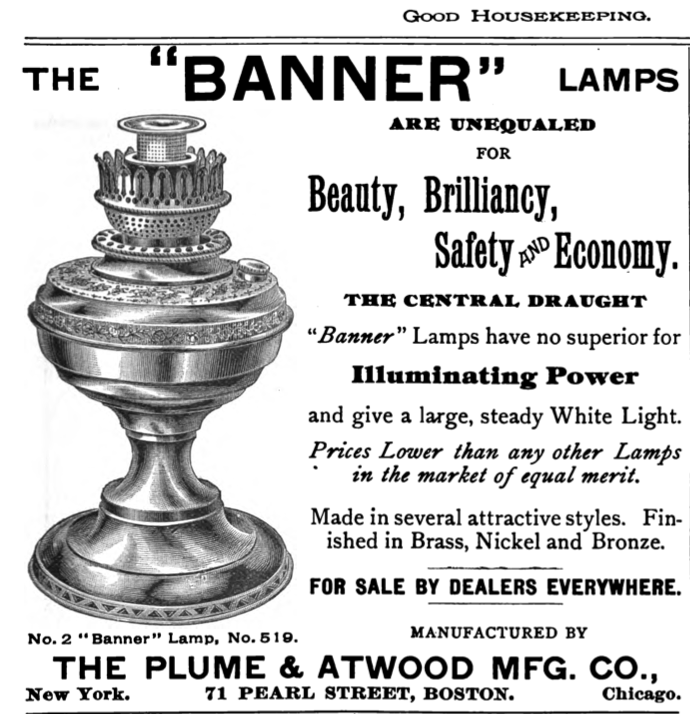 Advertisement for a circular wick lamp from Good Housekeeping​, December 6, 1890. The reason we don't see circular wick lamps much any more is that the round wick is significantly harder to produce than a flat one: this makes them correspondingly more expensive. 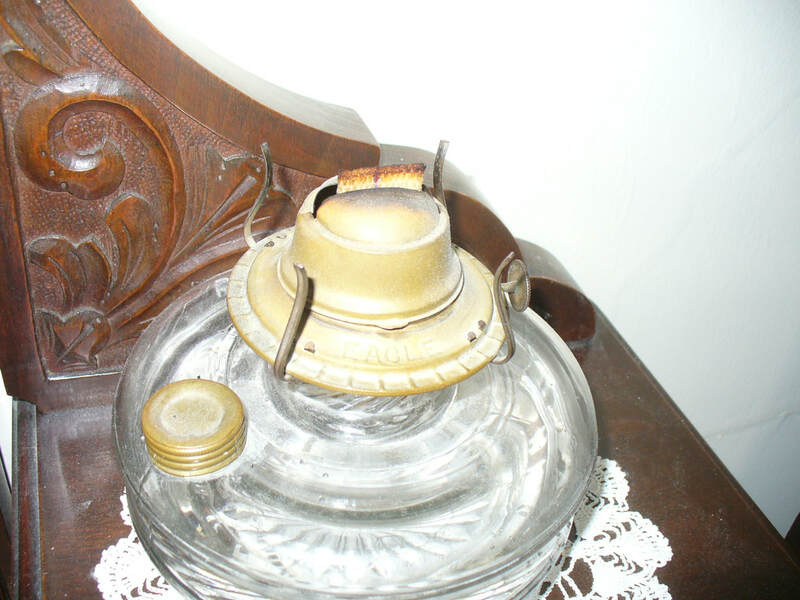 After electric lighting became standard people no longer prioritized the brightness of oil lamps because they were no longer using them for everyday activities. Given a choice between a cheap option to have around for emergencies and ambience, versus an expensive option they would hardly ever use, most people choose the cheap option. For this reason, demand for round wicks decreased after 1930; when it became harder to find the wicks people got rid of the lamps, and it became a self-feeding cycle that led to the virtual disappearance of circular wick lamps. Add to this the fact that circular wick lamps are made of metal —even the really fancy ones that have pretty glass or ceramic exteriors still have a metal reservoir, for practical reasons involving physics and chemistry. ​During WWII, there was a huge push to round up every last scrap of metal that wasn't currently in use and contribute it to the war effort. 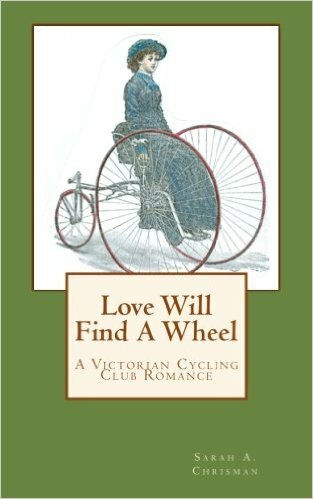 Thus, whatever circular wick lamps people happened to still have in their attics or garages were prime targets for the metal drives. Flat wick lamps were more likely to have reservoirs made out of glass, which is less useful for making into airplanes for fighting Nazis. 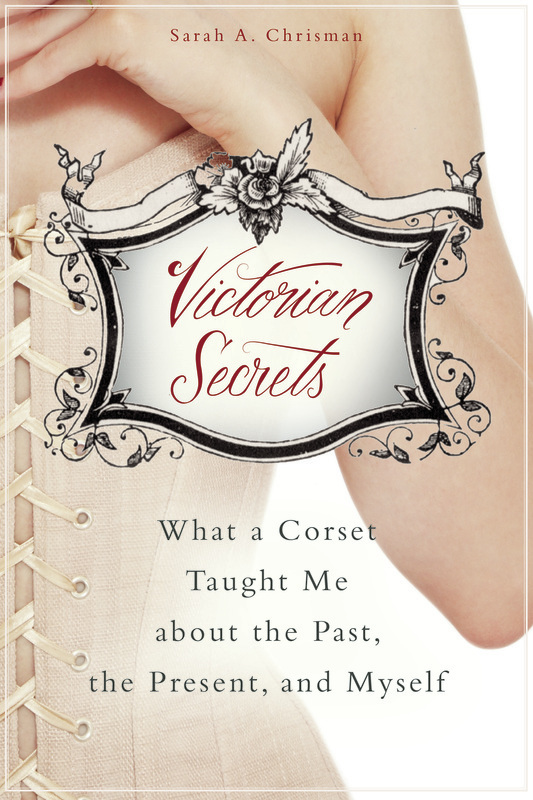 This sort of thing is what historians call survival bias. 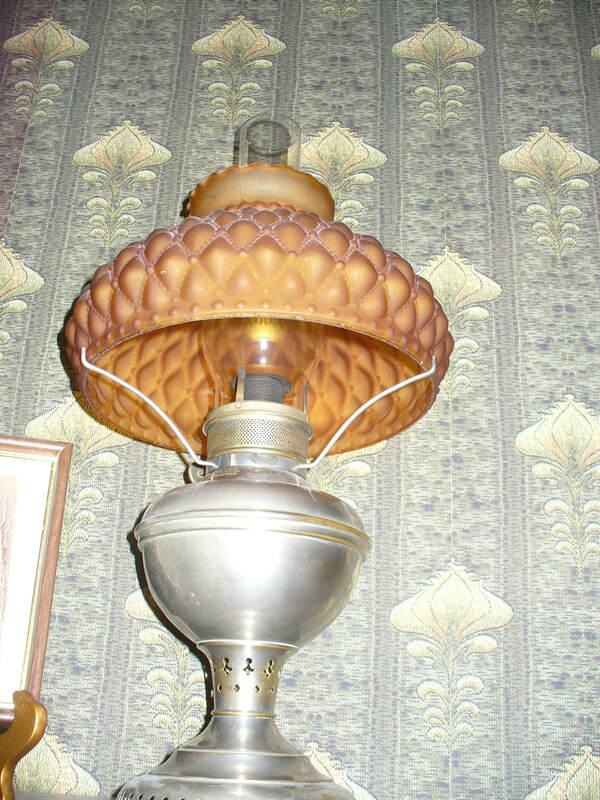 Left: Circular wick parlor lamp, circa 1888. 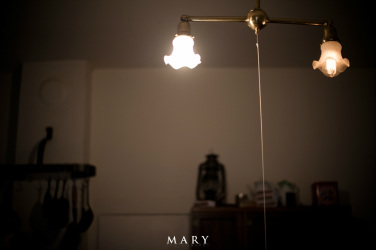 A metal reservoir extends down into the lamp's ornamental ceramic base to hold the kerosene, and more metal forms the pedestal on which the lamp rests. 1897 Miller lamp in my writing den. Besides the disposable wick, the only non-metallic parts in this one are the chimney and the shade. Whereas the flame spreader of a flat wick lamp is built into the burner, the flame spreader on a circular wick lamp is a separate piece which is removed when the lamp is cleaned. When I fill our circular wick lamps, in addition to wiping char off the wicks I also wipe soot off the flame spreaders and make sure the air vents are clear of dust. 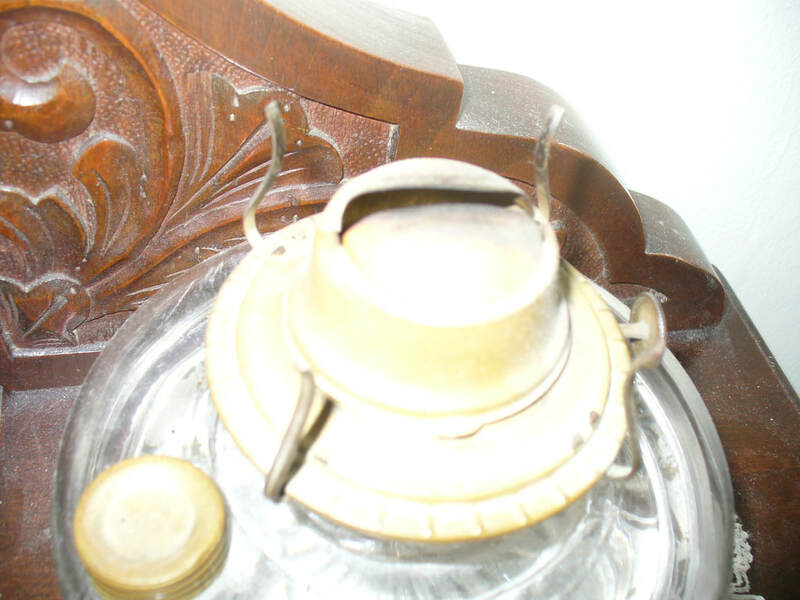 The picture above shows our 1897 Miller lamp without its flame spreader (to show the circular wick) and the picture below shows the same lamp with the flame spreader in place. The flame spreader flares out the flame and makes it even brighter than it already is. Different lamp companies had all sorts of engineering battles and competing patents to produce the best flame spreader / burner combination. Picture them as analogous to the fights between modern cell phone companies over marketable aspects of their products. Filling port, with the Miller logo. 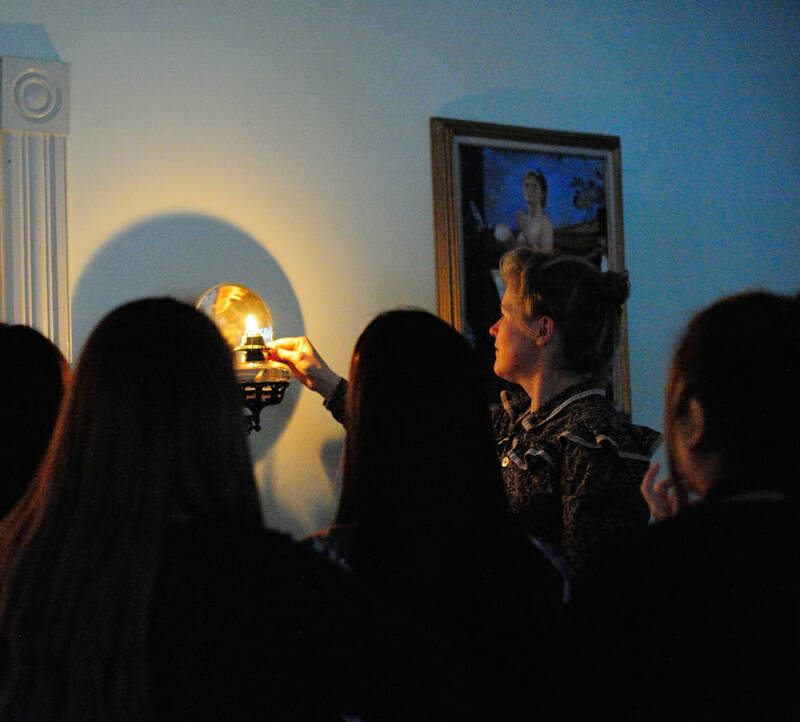 The students who toured our home were quite surprised by how bright our Miller lamp is —and how much warmth it produces! Students feeling the warm draft above the Miller lamp. 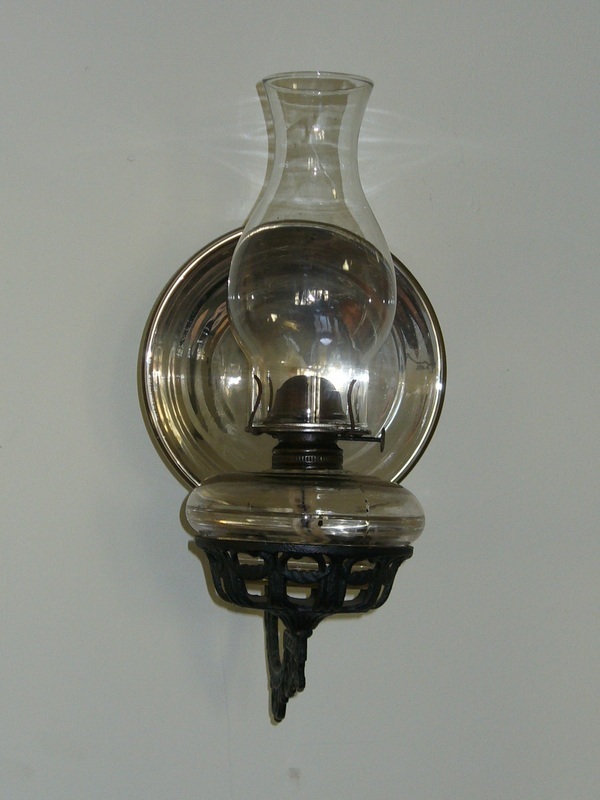 For more information on the history of circular wick lamps, please visit: http://www.milesstair.com/B_&_H_lamps.html Replacement wicks for antique lamps can be purchased on this excellent site. 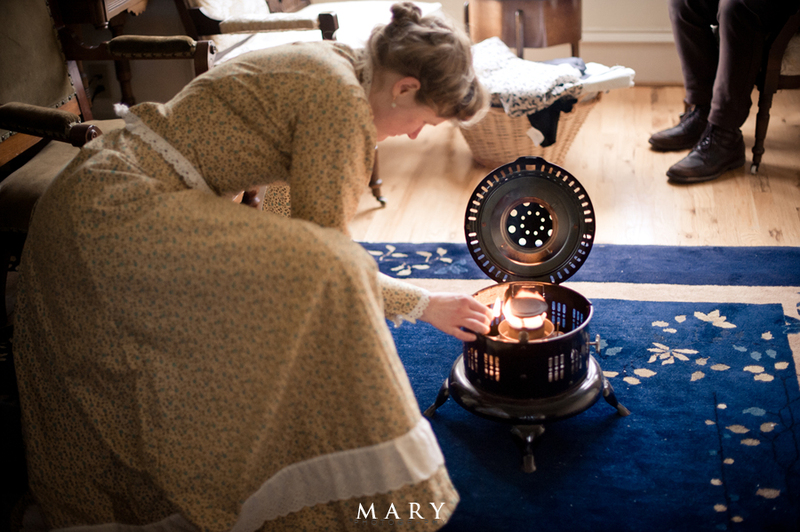 Round wick lamps are still produced in very small quantities, mostly for the Amish community and people who live "off the grid" for various reasons. In the U.S. the primary manufacturer is the Aladdin company. You can get their lamps through http://www.aladdin-us.com. 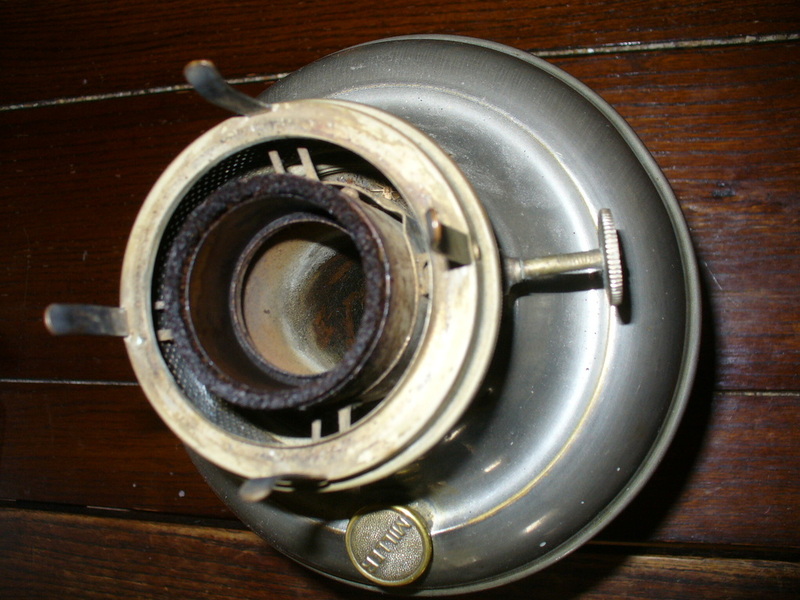 The burner on our late 19th-century Perfection heater uses the same circular wick technology found on the center draft lamps, just on a larger scale. 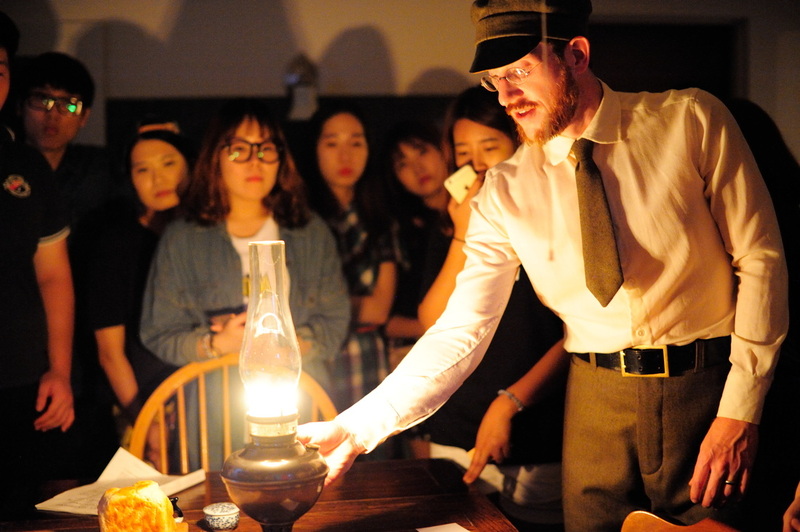 Image courtesy Estar Hyo-Gyung Choi, Mary Studio. Besides its wonderful practicality as a heater, in a pinch the Perfection heater can double as a stove. 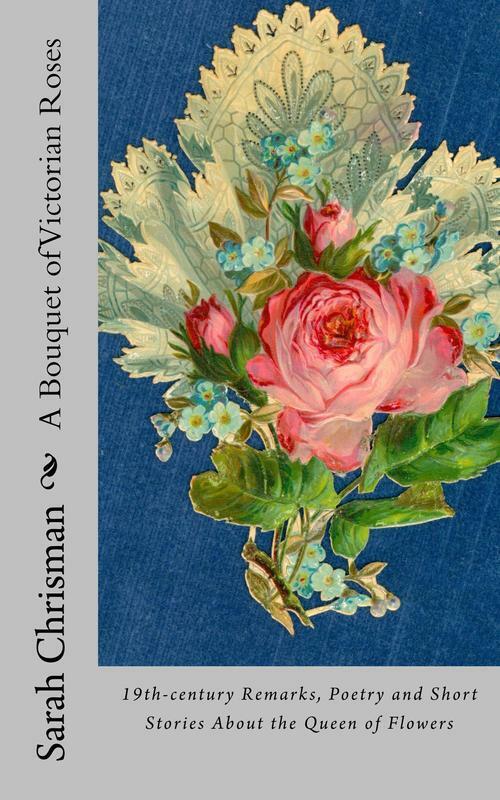 An old Canadian cookbook reported that such stoves are "very useful, especially in summer... It is as safe as any stove if properly cared for, but must be kept clean. Directions are given with each stove.... There are many types of kerosene stoves and many sizes, and this should be remembered when one is purchasing." —Pure Gold Manufacturing Company Limited. Blue Ribbon and Pure Gold Cook Book, Seventeenth Edition (no date), p. 144. 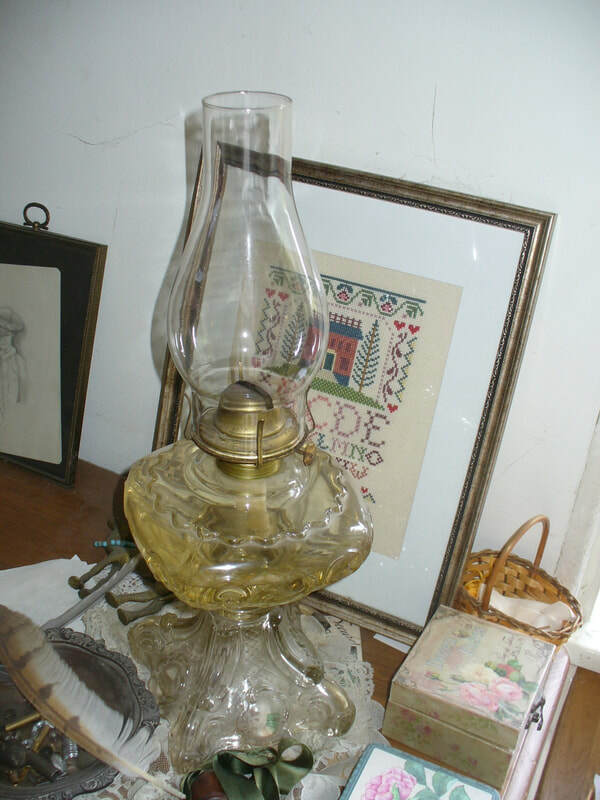 We typically use oil lamps and candles when we are home by ourselves, and save the electric lights when we have company visiting. This practice was very common in the early days of electricity, and it helps make the bulbs last a very, very long time. In four years, we have only had to replace three bulbs. The style of this candleholder dates back to 18th-century Colonial days. 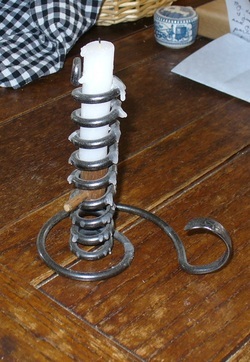 A courting couple's time to socialize would be measured by the time it took a candle to burn down to the holder: the mobility of the wooden platform upon which the candle rests allowed a chaperone to adjust the time allowed according to how suitable they felt the potential suitor to be. 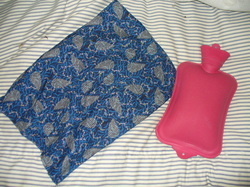 Hot water bottles (generally made of natural rubber) are wonderful little packets of warmth on cold days. -Cover with a pillow case or hot water bottle cover, so that you will have snuggly cloth next to your skin instead of rubber. 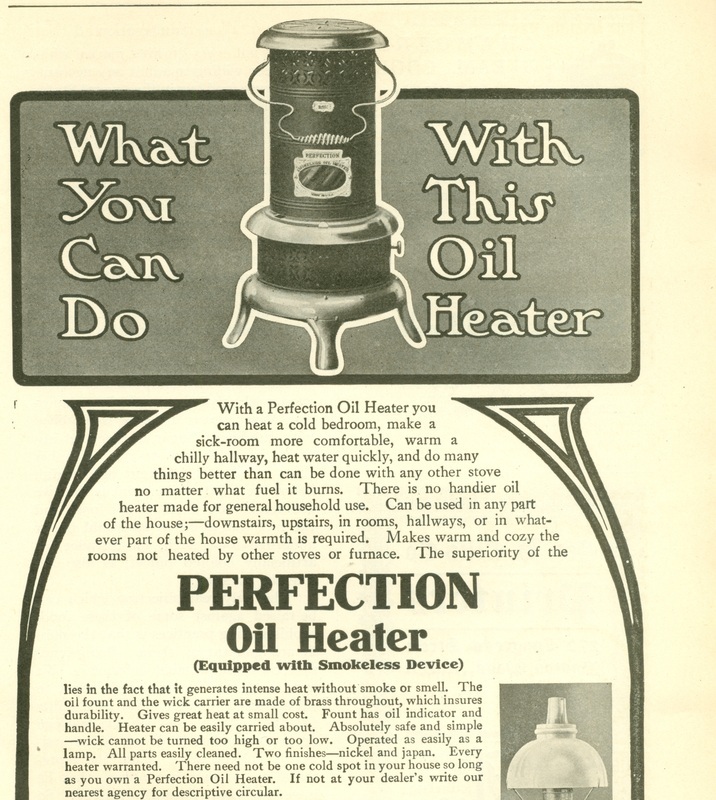 Gas parlor heater, circa 1890's. 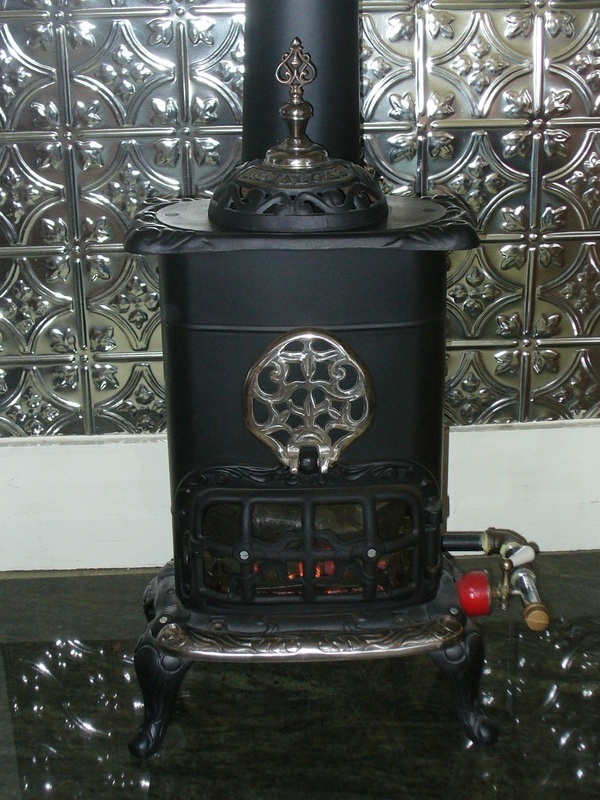 This Grand model #114 was made by the Cleveland Cooperative Stove Company in the 1890's. It originally burned coal gas, but has been converted to burn propane. Unlike many modern propane stoves which use ceramic faux logs as flame spreaders, our lovely stove uses faux coals made from volcanic rock. 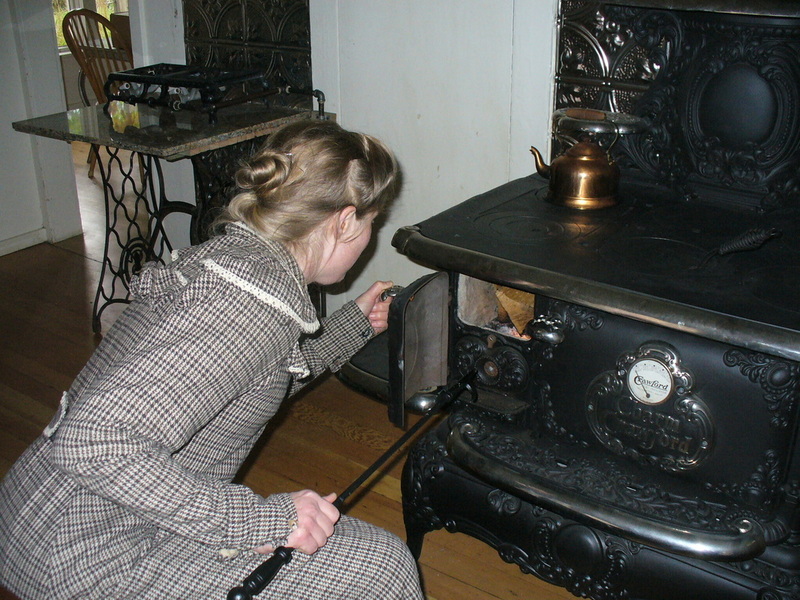 The stove itself is composed of both cast iron and steel components and is manually lit with a match. The windows in both our parlor heater and our bedroom heater (below) are made of thin sheets of mica, a clear stone. Mica was favored over glass for use in heaters because mica is less easily damaged by heat. 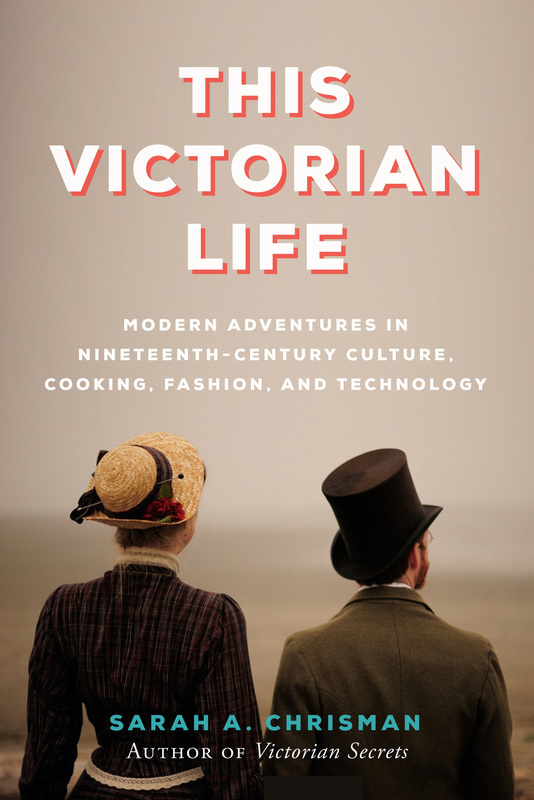 "In GOOD HOUSEKEEPING of April 16th appears an article on "Stoves" by Jennie Cowley Spruce, in which she says: "Many persons are not aware that mica can be purchased more economically by the sheet, and the small pieces or faces cut out with ordinary shears at home." In answer to this I would like to give a few prices. Mica 2 1/2 x 3 inches is listed at 75 cents per pound, 2 1/2 x 6 at $5.40, 3x3 at $1.88, 3x5 at $10.25, 3 1/2 x 6 at $12 and 6x8 at $13.40. The discount is the same for all sizes and varies each year according to the amount on the market, a fair discount to a dealer being from 50 to 60 per cent off. 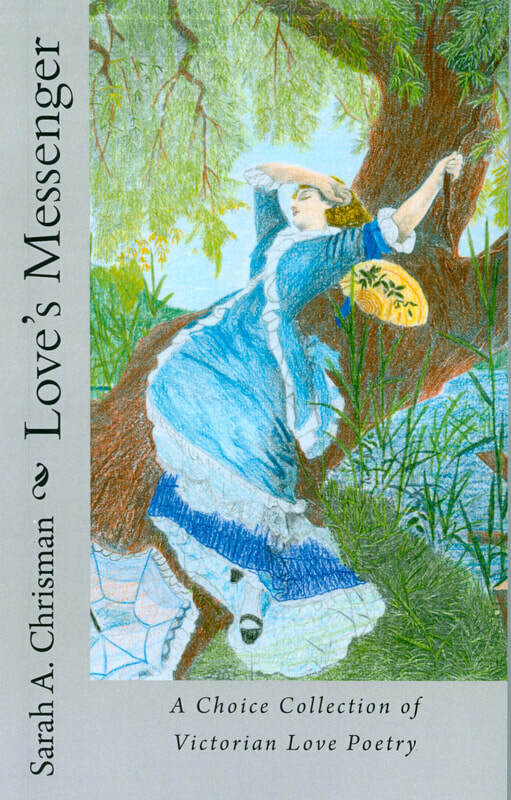 If Jennie Cowley Spruce will compare the above prices she will see that a sheet of mica is not cheaper than a number of small pieces. When mica is taken out of a mine it is split off the side of a ledge and comes off in an irregular shaped piece, when split some pieces go across the block but the majority are quite small. The largest piece I ever saw was about 8x10 inches and the largest block was 5 inches thick and when split the pieces varied from 1 x 1/2 to 6x7. 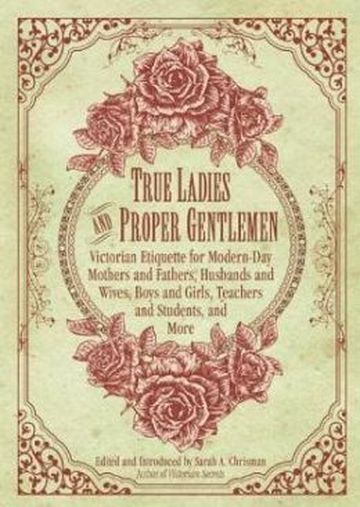 ​Good Housekeeping, May 27, 1887, pp. 50-51. 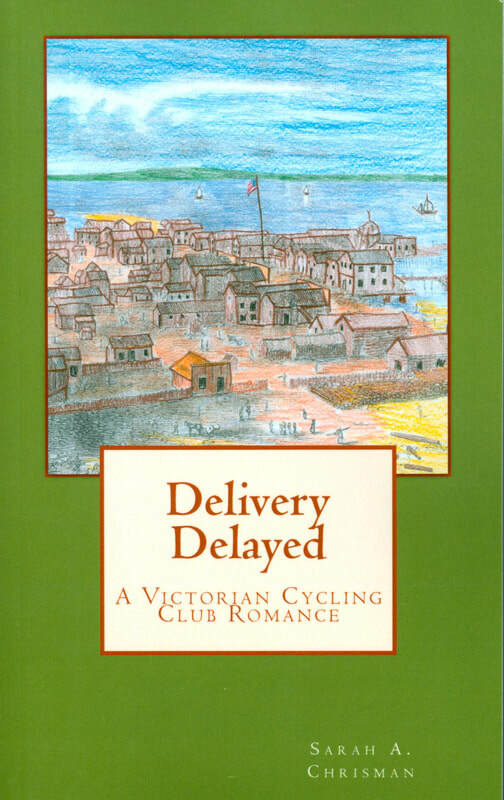 Here is a link to a piece from 1888 on how mica was quarried and shaped: "Dressing the Rough Mica." 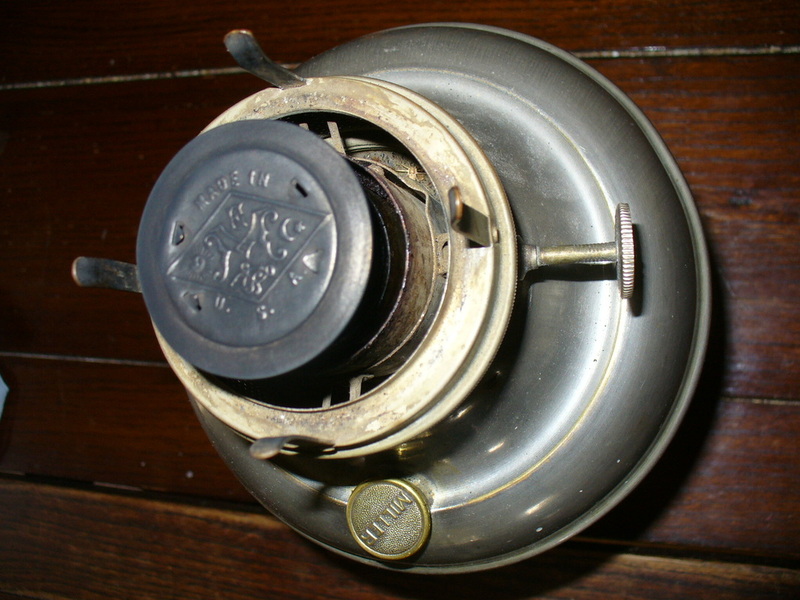 Gas miniature heater, circa 1890's. 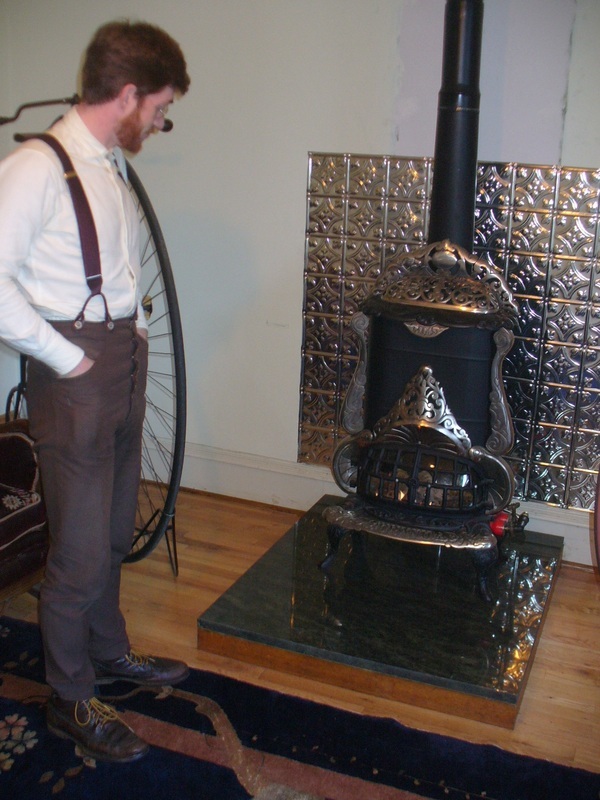 The tiny gas heater in our bedroom was likewise made by the Cleveland Cooperative Stove Company. 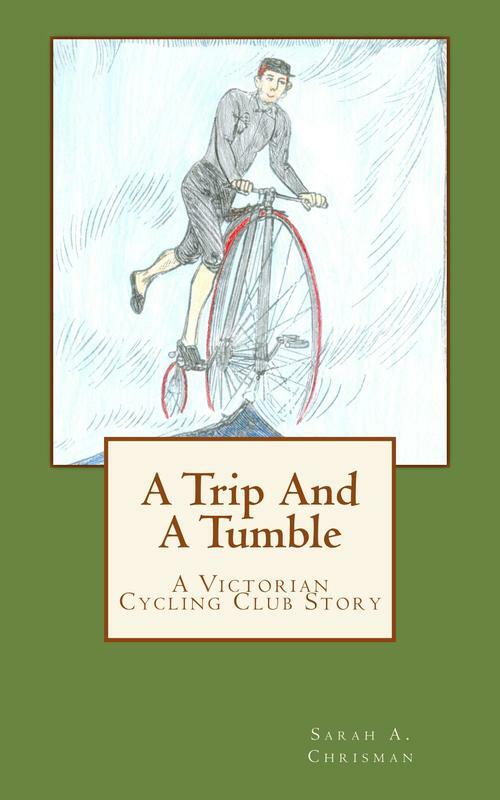 It was originally a salesman's sample, which would be brought around to potential buyers to show off the quality of the company's wares. The flame spreaders are faux coals made in England for this type of heater. The finial at the top is removable so that a kettle may be warmed over the heater. 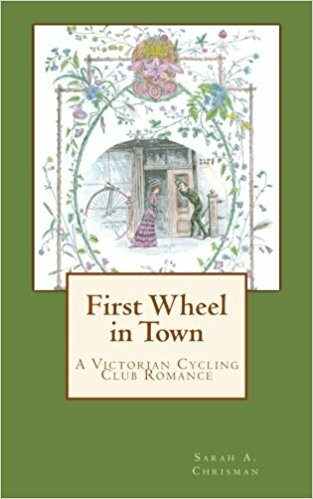 -Sarah's writing den / "Tillie's room"